Numerous members of the Ron Paul Institute for Peace and Prosperity have spent years as professional spin-doctors for Russian President Vladimir Putin and other leaders of oppressive regimes, according to an analysis by the Washington Free Beacon. The institute’s namesake, former congressman and failed presidential candidate Ron Paul, recently made headlines when he defended Putin’s invasion of Ukraine. "Actually he has some law on his side," Paul said on Fox Business Channel’s "The Independents" last week. Those comments follow the line taken by Paul’s think tank, which has served as a fount of pro-Russian talking points and conspiracy theories about the U.S. government’s and NATO’s role in Ukraine. The executive director of RPI and several members of its executive board have long ties to pro-Kremlin outfits, including a public relations shop created to restore Russian President Putin’s global image. John Laughland, a member of RPI’s academic board, serves as director of studies at the Institute of Democracy and Cooperation in Paris, a pro-Kremlin NGO that was founded in consultation with Russian government officials. The IDC was founded as an effort to "repair Russia's damaged image in the US and Europe and at the same time extend the reach and influence of the [Government of Russia]," according to a U.S. State Department cable published by Wikileaks. The group’s creation was first announced by Putin in 2007 and it has published reports defending Russia on human rights issues. "[W]e expect [IDC leadership] to be energetic, pro-Kremlin public figures when they take up their new duties," said the U.S. State Department cable. Laughland told the Washington Free Beacon that the IDC is funded by Russian businesses and private citizens, but declined to name them. 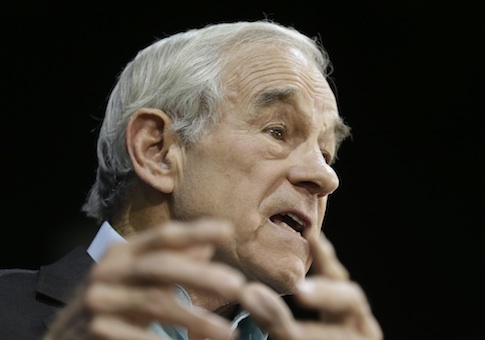 He said he joined the Ron Paul Institute’s board at the request of RPI executive director Daniel McAdams, a former foreign policy aide to Paul. Laughland said the IDC has not contributed money to RPI. The IDC’s New York office told the Free Beacon that it has no formal connection to the Ron Paul Institute, but "sometimes will send them an article" to publish. Ron Paul’s Foundation for Rational Economics and Education, which oversees the Ron Paul Institute, did not respond to requests for comment. Laughland, McAdams, and RPI academic board member Mark Almond also worked for the now-defunct British Helsinki Human Rights Group, a pro-Kremlin NGO that defended dictators against human rights abuse charges. The BHHRG has no relation to the International Helsinki Federation for Human Rights, a human rights group founded in response to the Helsinki Accords. The International Helsinki Federation for Human Rights referred to the BHHRG as a "PR flack for a new breed of authoritarian rulers in Europe." The Daily Beast reported last year that the BHHRG "regularly advocates positions that regurgitate Russian nationalist talking points, minimize xenophobic and illiberal attitudes prevalent in the former Eastern bloc, or excuse authoritarian tendencies." Laughland has come to the defense of the late Serbian President and war criminal Slobodan Milosevic, and denounced the International Criminal Court as a "kangaroo court." McAdams and Almond have defended Belarusian dictator Alexander Lukashenko, with Almond calling Lukashenko's rigged 2006 election victory a "landslide," according to the Daily Beast. "This whole thing that Putin is the big cause of the trouble, and yet there’s pretty good evidence that the Europeans as well as the American government had to contrive to have the overthrow of a government that most people say had been elected," Paul said on Fox Business Network last week. "U.S. and Western leaders should be lining up to thank Vladimir Putin for a painful but thorough lesson in how the adult leader of a nation protects his country’s genuine national interests," wrote Michael Scheuer in an article published by RPI last Thursday. Paul Craig Roberts claimed in another RPI article that "Washington’s neoconservative nazis have been agitating for war with Russia for a long time" because they "want to remove one of the three remaining restraints (Russia, China, Iran) on Washington’s world hegemony." Putin is not the only repressive leader supported by RPI. The group has also defended the Syrian Bashar al-Assad regime, former Libyan dictator Muammar Qaddafi, and the Iranian government. "The war criminals in Washington and other Western capitals are determined to maintain their lie that the Syrian government used chemical weapons," wrote Roberts last August, claiming the chemical attack that killed hundreds was not carried out by the Assad regime. He added, "At Nuremberg the Nazis were sentenced to death for precisely the identical actions being committed by Obama, Cameron, and Hollande [in Syria]." McAdams posted a photo last June depicting Libya as prosperous and safe while Qaddafi was in power, and in ruins after he was overthrown in the country’s civil war. 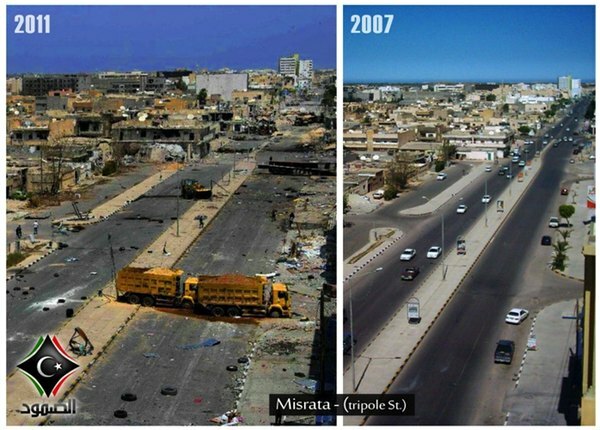 "Here is a picture of Libya before and after Hillary Clinton ‘engaged’ the Libyan people," he wrote. While Paul has been defending the Russian government, his son, Sen. Rand Paul (R., Ky.), a prospective 2016 presidential candidate, has taken a tougher stance against Putin. "Vladimir Putin's invasion of Ukraine is a gross violation of that nation’s sovereignty and an affront to the international community," Sen. Paul wrote in Time magazine last week. "If I were president, I wouldn’t let Vladimir Putin get away with it," he added. Sen. Paul’s more muscular language came after some conservatives criticized him for saying Republicans should not "tweak" Russia over the Ukraine issue. This entry was posted in Politics and tagged Crimea, Rand Paul, Ron Paul, Ukraine, Vladimir Putin. Bookmark the permalink.